Tweet when you see the pink Race RV. It’s officially “Race season!” The Komen Orange County Race for the Cure will be Sunday, September 26 at Fashion Island. An event that brings together up to 30,000 people takes planning, but thank goodness much of the anticipation is fun. The Fourth of July weekend is the traditional start of publicizing the Race. We want to encourage everyone to register, to start fund raising or start a Team. One hard-to-miss message about the Race was unveiled at the Huntington Beach parade on July 4. 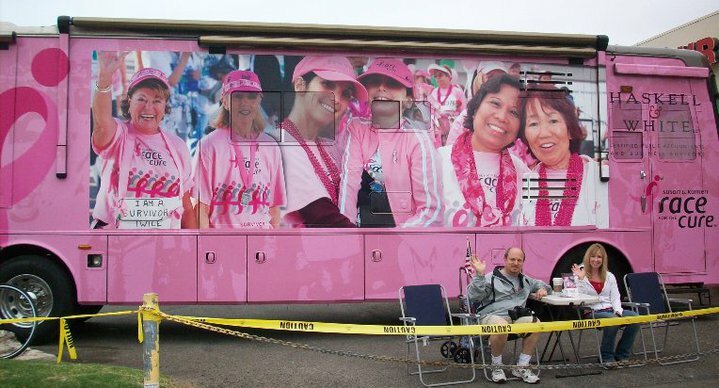 The “pinked out” RV is courtesy of Wayne Pinnell of Haskell & White LLP. Pinnell is one of the new Pink Tie Guys for Komen and he is clearly embracing his role. Be on the lookout for the RV in Orange County the rest of the summer. Tweet when you see it. Farmers & Merchants Bank gave survivors the spotlight. If you need to register for the Race, want to know how to form a Team or purchase booth space in the expo, go to www.komenoc.org. Komen OC’s Grants Award Breakfast! Komen OC is awarding more than $900,000 in grants this Friday at our annual Community Grants Award Breakfast. The community groups receiving the grants serve a diversity of key populations in the area, and will use the grants specifically to implement breast health programs and initiatives to promote early detection of breast cancer and provide access to care throughout Orange County in an effort to save women’s lives. By implementing an extensive range of breast health initiatives, Komen grantees take proactive steps in ensuring that all women and men have access to life-saving breast health care. Last year alone, more than 8,500 uninsured and underserved women were provided assistance in obtaining free mammograms. “Music for the Cure” is coming . . . and going . . . all over Orange County. Very cool signs on Orange County Transportation Authority buses are “tooting the horn” about the upcoming September 12 concert. Bravo to Farmers & Merchants Bank for sponsoring the bus signs and this new collaboration. A special thanks goes to F&M CEO Henry Walker, a longtime supporter of the arts, and a Komen Pink Tie Guy. Pacific Symphony will close the summer season at Verizon Wireless Amphitheater with the dramatic “Tchaikovsky Spectacular” and the night will be a partnership with the Komen OC. Imagine the sounds of the 1812 Overture, the night air, fireworks, a picnic basket and the spotlight on Komen and the upcoming Race for the Cure on September 27. What harmony! You can get Music for the Cure tickets at http://www.pacificsymphony.org/main.taf?p=9,5,6,6&ProductionID=5453 Don’t forget to enter the Promo Code: “Komen” to receive the 20% discount on your ticket purchase. You can register for the Race at www.komenoc.org. 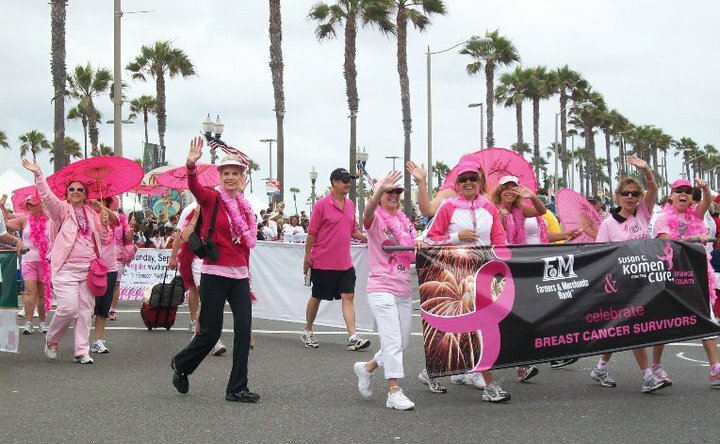 Komen Orange County Race for the Cure has a big goal – to raise $3.1 million for vital breast health services. But as everyone knows, you eat the elephant one bite at a time. With that philosophy in mind, Komen Orange County has launched the 125 Challenge, a call-to-action for each Race participant to raise at least $125 each. Why $125? That is the average cost of a Komen-funded mammogram. The need for breast health screenings is great this year because of the increasing number of women who are, or soon will be, without health insurance and unable to afford breast health care. As an incentive, each Race participant who meets the 125 Challenge will receive a reusable tote bag, supported by Farmers & Merchant Bank. It is the fall fashion statement that says you can meet a worthwhile challenge. Spread the word. See the complete list of incentive prizes you can earn by raising much-needed pledge dollars! The Orange County Affiliate of Susan G. Komen for the Cure is proud to partner with the Pacific Symphony and Farmers & Merchants Bank to present “Music for the Cure,” a concert taking place at the Verizon Wireless Amphitheater on September 12 at 8pm. The concert, “Tchaikovsky Spectacular,” will bring awareness to the Race for the Cure and to Komen’s mission to end breast cancer forever. The collaboration is a model for nonprofit partnerships everywhere, and serves as a way to break outside of the box in promoting our cause. We are so pleased to have Farmers & Merchants Bank CEO Henry Walker playing an instrumental role in the creation and culmination of this concert by joining the two organizations to maximize outreach and exposure for a life-saving cause. Walker has been a true supporter of both Komen OC and the Symphony, serving as a Pink Tie Guy for Komen and a board member for the Pacific Symphony. The performance will take place on a summer evening only two weeks before the September 27 Race for the Cure, serving as an ideal reminder that the fight against breast cancer continues. In addition, this is an opportunity for the general public to support two beloved causes, breast cancer awareness and the preservation of music. Each cause is different; both are important. For more information about the September 12th “Music for the Cure” concert, please visit the Pacific Symphony’s website here. For more about the Orange County Race for the Cure, please visit Komen OC’s website here.